Below is a recent article in the Economist about the current state of Hait's development. The Canadian government funded the Copenhagen Consensus Center (CCC) think tank to study the impact of different policies in Haiti - what would they cost and what would have the greatest impact? The Haitian government can't do everything at once and the intent is to help it prioritize. Interventions that come out on top include fortifying wheat flour with micrconutrients and reforming the electrical system. Learn more at the CCC website which includes a PPT presentation on the top ten proposed interventions. 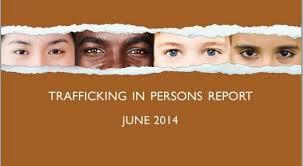 Last month, the U.S. State Department released the 2014 Trafficking in Persons Report. As in previous years, the report noted serious shortcomings in the Haitian government's efforts to prevent and respond to human trafficking. There is some good news, though - in 2014 the Haitian government enacted a law to criminalize human trafficking which is a welcome and much-needed step. The country narrative for Haiti follows below.